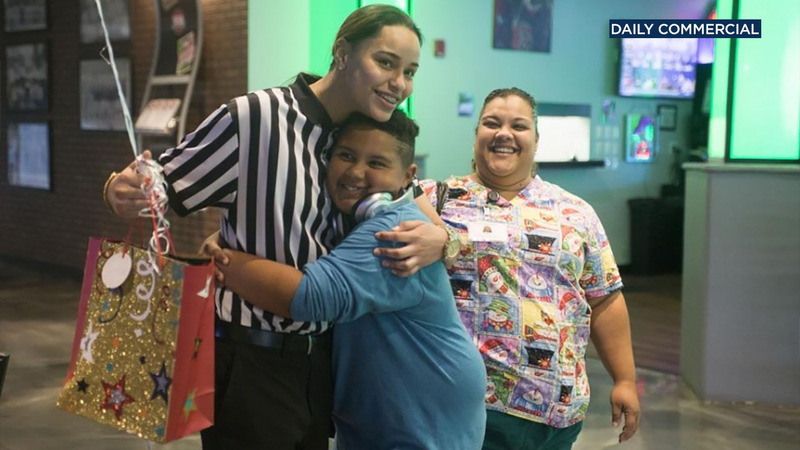 LEESBURG, Florida -- A young Foot Locker employee's random act of kindness made a boy's day after she bought him a pair of shoes his family couldn't afford. The Daily Commercial reports 10-year-old Jonas Nielsen went into a Foot Locker in Leesburg, Florida, on Dec. 4 and asked to try on a pair of Nike Air Jordan shoes. "Why you making this young lady work when you know we can't afford these shoes?" his mother, Gigi Pena, told him. That's when 18-year-old Jadyn Vasquez asked Pena if she could purchase the shoes for the boy. "There's many reasons I had for helping him," Vasquez told the Daily Commercial. "It's about spreading joy, giving to others, but mostly I just knew it was the right thing to do." Jadyn Vasquez (left) helps Jonas Nielsen (right) try on a pair of shoes. Jonas' mother said he'd never had a new pair of shoes from a store, which is something Vasquez said she could relate with having spent time in foster care. "As a kid, I had always wanted a pair of Footlocker shoes but could never afford them, so I could relate to Jonas," she told the Daily Commercial. "I was in foster care for almost two years and moved in with my new adoptive parents about this time last year. I might not have had the greatest past but they've given me so much to look forward to. I realize that the world might not be beautiful all the time, but we are the ones that have to make it what we want it to be." In an even more meaningful gesture, it just so happened to be Jonas' birthday. Jadyn Vasquez (left) poses for a photo with Jonas Nielsen (right). "I'm going to remember this for the rest of my life," he said. "I want to help people just like she did. She's awesome."